Peat moss is widely used in gardening and horticulture but it is not the best choice. Peat has been used as a fuel, for insulation, for building bricks, as a planting medium, as an ingredient in bed preparation and as a top dressing for potted plants and floral arrangements. It is from a group of plants call sphagnum. These mosses grow in wetlands in cooler climates and are an important part of the ecosystem in cleaning water, removing pollution and storing carbon dioxide from the atmosphere. These bogs capture 100 tons of carbon every year from the atmosphere and store more than 500 billion tons of carbon even though they compose only 3% of the land and fresh water areas. Mining of peat requires the draining of wetlands, drying, milling, packaging and transportation of the product many miles to market. Some companies in Canada and the northern U.S. have started trying to reestablish bogs after mining. It is a step in the right direction but scientists say it takes more than 90 years to just reestablish the original biodiversity and much longer to become a fully functioning wetland. Over 10 million cubic yards of peat moss are harvested each year in Canada and another 1 million cubic yards in the U.S. It takes about 1,000 years for a one yard thick layer of peat to accumulate. Peat grows on the surface of the bog where there is oxygen. As the plants die, they settle to the bottom where there is very little if any oxygen (anaerobic) and slowly decay, forming thick mats of partially decomposed plant material. More than 90% of the extremely valuable wetland peat bogs in England and New Zealand have been destroyed by the mining of peat. Many countries now prohibit or have placed severe restrictions on the mining of peat wetlands and the sale of peat moss. 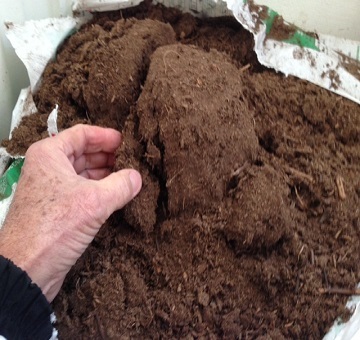 The most valuable form of peat in horticulture is the layer that forms just under the surface with deeper layers becoming lower and lower in quality and value. This is why gardeners often see big price differences for peat moss at garden centers. The worthless low quality peat moss is sold at the lower prices because it does not work well. The surface peat moss layer can hold 16 - 20 times its dried weight in water in the cells. The low quality peat moss at the bottom does not hold near the same amount of water or have much benefit at all. It is sometimes sold under the name of "Peat Humus" as a marketing ploy. Due to its acidity, peat moss can kill bacteria (good and bad) and as a result was used as a bandaging material in treating wounds during WWII. excellent bulb and tuber winter and summer storage due to its anti-microbial properties. Research has shown that we now have many alternatives to peat moss that work better at lower cost and do not have the environmental consequences. Peat moss is environmentally bankrupt in today's gardening environment and shouldn't be used except for storing materials that need protection from rotting. For more information on this subject, read Organic Management for the Professional by John Ferguson, Michael Amaranthus and Howard Garrett.